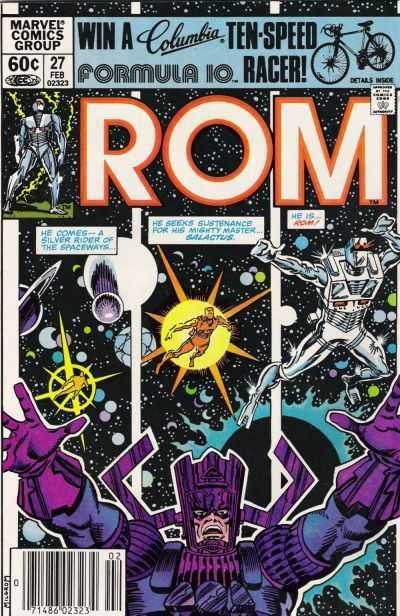 Rom has struck a deal with Galactus to spare Galador in exchange for another planet to sate his hunger. The planet in mind is the Wraith home world in the Dark Nebula and by offering up that particular world it solves not only the problem of Galactus, but also the Wraiths. The only problem in this equation is that Dark Nebula is a stain upon the universe and it may be even beyond Galactus’ great powers to vanquish. This current storyline has been one of the strongest to date, finding Rom back on golden Galador with his fellow Spaceknights. Bill Mantlo also exhibits some of the strongest dialogue to be featured in the book, really nailing down the majesty and god-like feeling that Galactus emits to those around him whenever he speaks. It was interesting to see Terrax the Tamer feel self-doubt and jealousy when Galactus likens Rom to the Silver Surfer, the greatest of his heralds. Terrax is usually a very formidable and imposing being and for him to act like such is very out of character. Also of note and extremely exciting was seeing Galactus battle in futility against the various forces of the Wraith’s Dark Nebula. It is rare to ever see Galactus humbled, especially the way he has been here and it proves that there are things even greater in the Marvel Universe than even Mighty Galactus. What this issue also proves is that Rom, perhaps one of the most honest people in the universe, can also be devious when he has to be. It could be seen as a character flaw, but also a strength as this is probably the first time that Rom has shown a trait such as this, and only because it was for the safety of his people. Yet another great issue in the can from the creative team of Bill Mantlo and Sal Buscema.